The exceptional climate-altering capabilities of cattle are mainly due to methane, which they blast into the atmosphere during their daily digestive routine. Cattle urine is a lesser-known climate offender. It produces nitrous oxide (N2O), which has warming power far greater than that of carbon dioxide (CO2), the main driver of global warming. A study conducted by the International Center for Tropical Agriculture (CIAT) and partners shows that these N2O emissions can be significantly curbed by healthy cattle pastures. 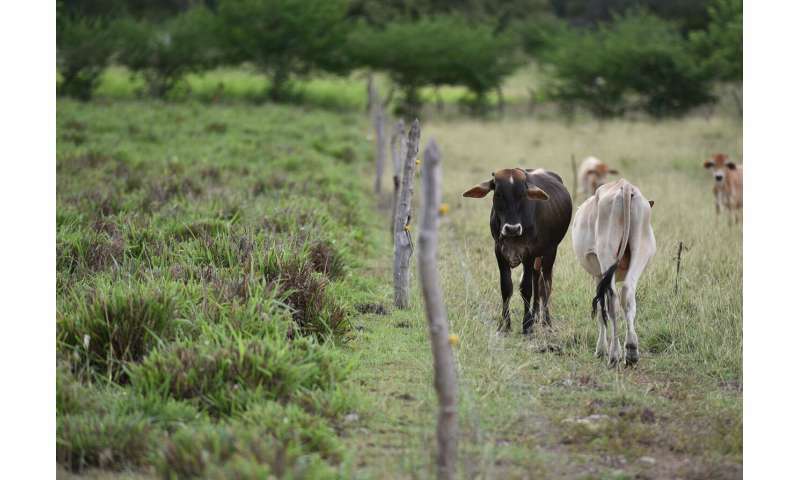 For the study, researchers collected urine from cattle at research sites in five countries across Latin America and the Caribbean. They spilled these 500 mL samples on paired cattle fields classified as degraded or healthy, which was determined by vegetation coverage. In six of the seven test sites, degraded pastures emitted significantly more N2O—sometimes up to three times as much. The results were published January 29 in Scientific Reports, an open-access journal by the publishers of Nature. "Degraded pastures are bad in so many ways," said Ngonidzashe Chirinda, a CIAT researcher and the study's lead author. "This study adds to the case for land restoration. Degraded pastures not only affect food security and the livelihood of farmers today, but affects the livelihood of future farmers because they emit more gases that cause global warming." The results add urgency to global land restoration agreements, including Initiative 20x20, which aims to bring into restoration 20 million hectares of land into restoration in Latin America by 2020 as a first major step toward even more ambitious restoration targets. "This study highlights the importance of avoiding land degradation in the first place," said Todd Rosenstock, a co-author based at World Agroforestry (ICRAF). "Maintaining healthy pastures appears to reinforce goals of both the United Nations' Framework Convention on Climate Change and the UN Convention to Combat Desertification simultaneously." The curious results from the single test site that did not align with the study results—in Taluma, Colombia—may be attributed to a number of factors that merit further research. N2O emissions there were by far the lowest at any test site and were the same on both degraded and healthy pastures. The cattle urine used in the experiment had the lowest nitrogen content compared to the other research sites, which likely contributed to the results. The forage grass used there, Brachiaria humidicola, also has an especially high nitrification inhibition capacity, meaning that it prevents nitrogen from becoming N2O. The study is a victory for well-designed, modest-budget science. The project began with a weeklong training session at CIAT headquarters in Cali, Colombia, where a team of Ph.D. students from the additional participating countries—Argentina, Brazil, Nicaragua and Trinidad and Tobago—helped design the research plan and standardized the study's methodology. The students returned to their home countries and carried out the experiment to coincide with their area's rainy seasons, to assure similar climate conditions across study sites. (The exception was Taluma, which was sampled during a period characterized by low rainfall, which is also another possible reason why the N2O emissions were lower there). "The power is in the number of data points from all the different countries," said Chirinda. "Since work on emissions from livestock in the region is not common, this study generates at least one piece of information that is missing from theoretical greenhouse gas estimates in the LAC region," said Miguel Andrés Arango, a co-author and scientist at Colombia's AGROSAVIA, the nation's largest agriculture research organization. "Being able to estimate the real impact of cattle production will allow us to propose potential practices for reducing emissions," said Arango. "It is high time we know the emission factors for our agricultural systems." nitrous oxide (N2O), which has warming power far greater than that of carbon dioxide (CO2), the main driver of global warming. Water is the main greenhouse gas accounting for 90% of all greenhouse gas's effects. Do they get gender studies Phd's to do the climate science now? When too much water vapor accumulates in the atmosphere, it changes phase into liquid and solid particles with high albedos that can reflect energy away, leading to cooling. So when someone like you mentions water vapor as a powerful greenhouse gas, we all know you are artfully trying to deny the existence of clouds. It's a weak argument perpetuated by the simple-minded. Just knock it off already.